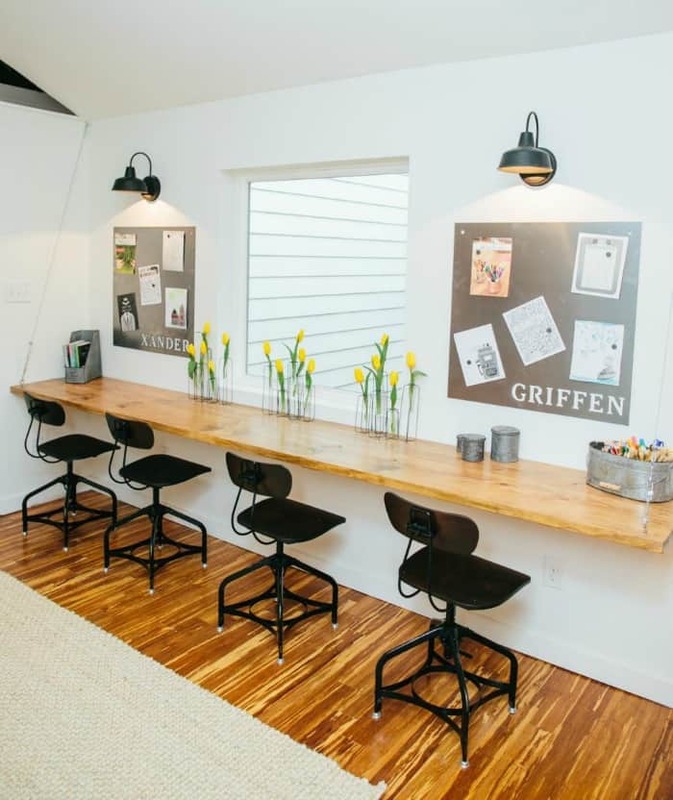 Is it possible to have a homework area for kids in a rustic farmhouse style home? I’m happy to report that yes, it’s entirely possible! Consider each one of these tips and inspiring ideas to help keep your child from sinking into the “I hate homework” blues. First of all – Make it an appealing space. Make it appealing to the eye and to the senses. The object is to create a space that will inspire and motivate the child who is using it. What child wouldn’t love a loft bed like this to do their homework? The shape of the footboard certainly has a farmhouse vibe. Plus, an arrangement like this is perfect for a small bedroom! 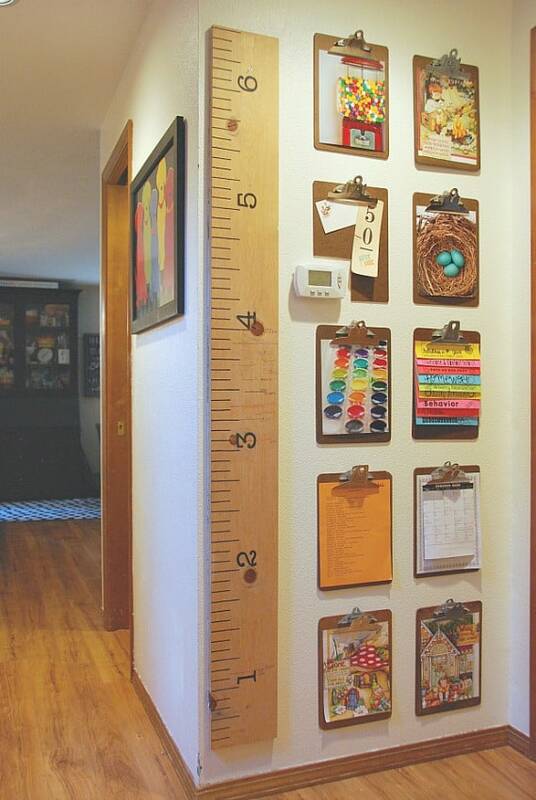 Need a homework area for multiple kids? Line up multiple tables or desks and designate each child’s spot with a marquee letter! Lucite chairs are almost invisible and keep the area from looking too cluttered. Keep it light and bright. 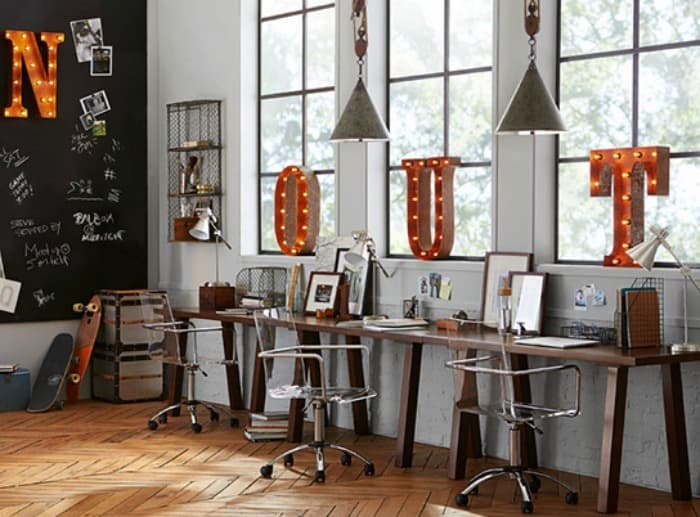 Everyone works better in a space that is cheery and brightly lit. I bet you heard this from your mom – “A place for everything and everything in its place”. Well, it’s true – most every adult that I know is much more productive when working in an organized spot. Kids are no different. Pegboard is awesome. Period. It can be cut to any size, painted any color, stenciled or framed. 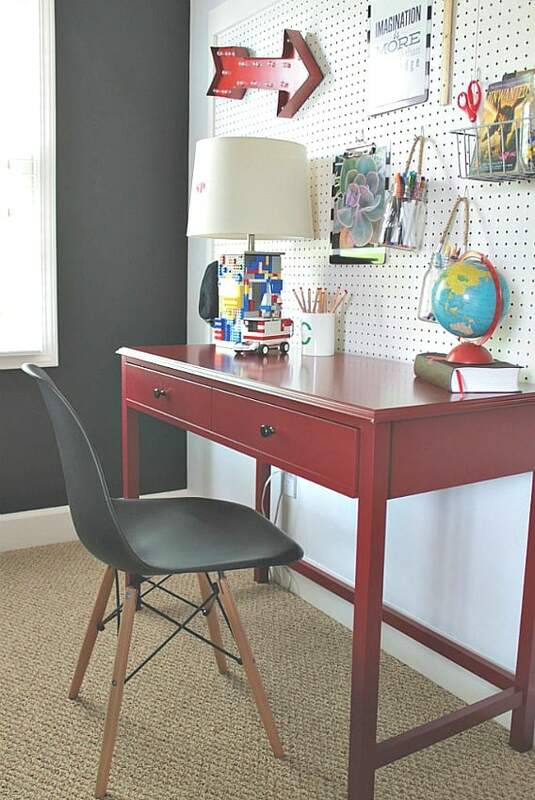 The availability of pegboard supplies makes it a great choice for organizing around a homework area. With that in mind – work to eliminate clutter. The clutter control solutions don’t have to be expensive – the dollar stores carry lots of storage options. Or you could even cover cardboard boxes that you have lying around with pretty wrapping paper. Install hooks nearby to keep backpacks within easy reach. 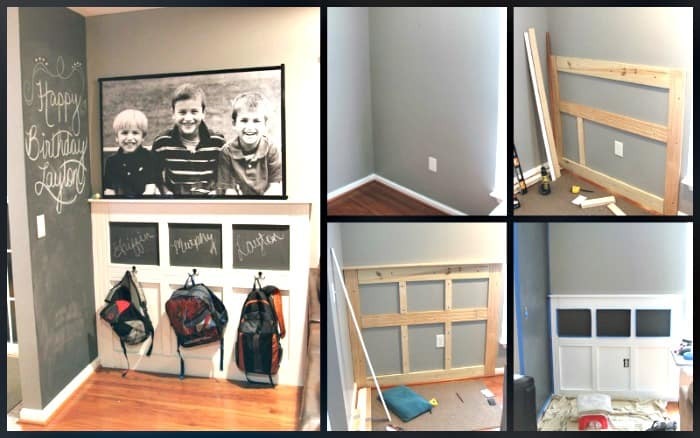 Make the space extra special with a board and batten treatment that includes a chalkboard area for personalization. 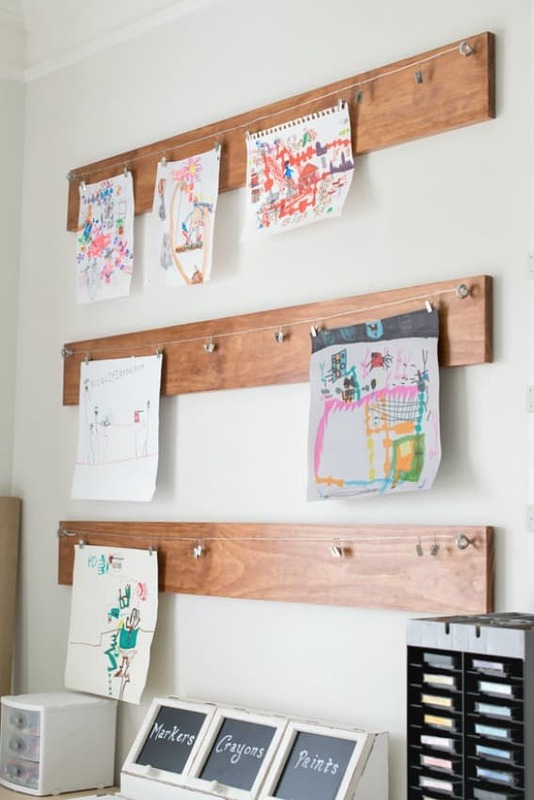 Paint inexpensive wood crates to hang on the wall instead of expensive bookcases. 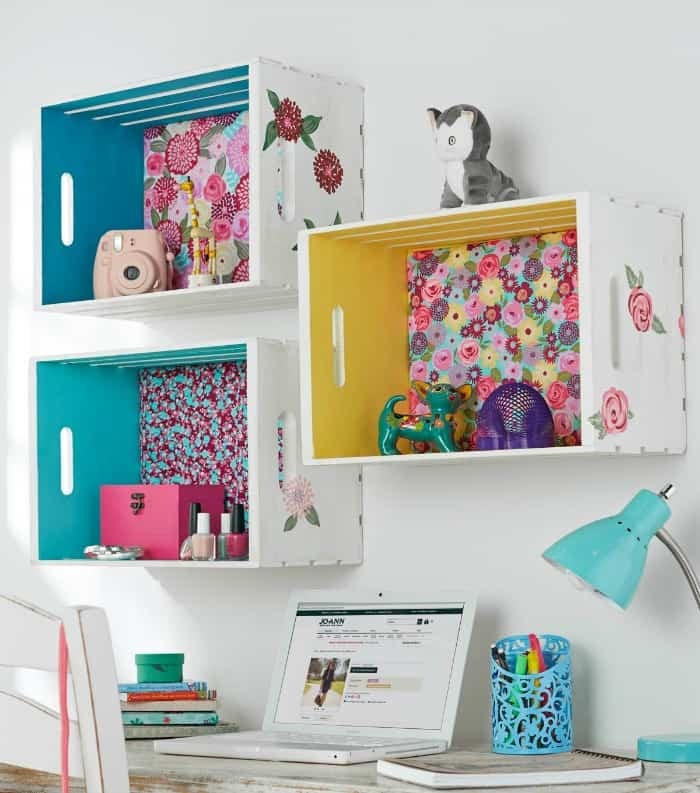 The interior of the wood crates can be brightened up with scrapbook paper. Clean and simple. 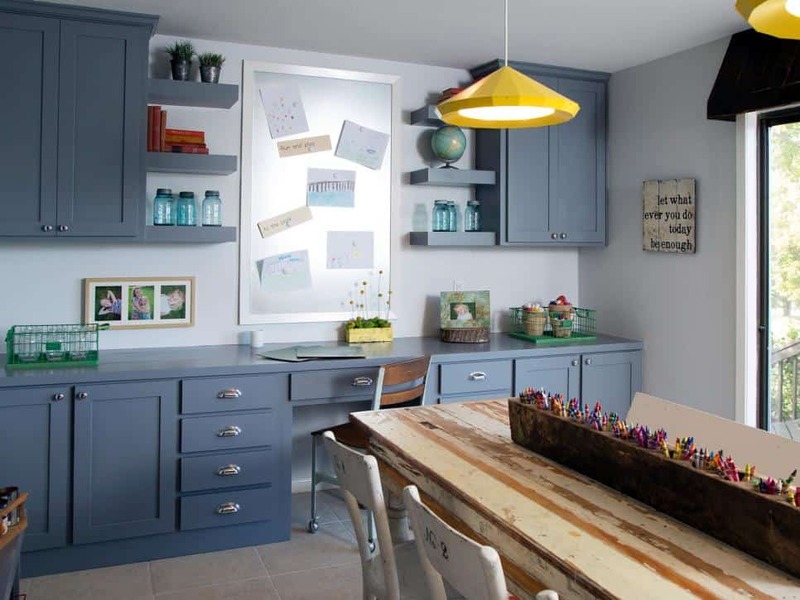 Who wouldn’t want to work in this streamlined, yet attractive homework station? Every child of every age is proud of their work. Giving them a special place to display their projects is one of the best ways to show them that you’e proud too. Accept that no matter how much trouble you’ve gone to or how much money you’ve spent, they likely won’t want to do homework and make peace with that knowledge. Discuss homework with your kids on a regular basis. Not just about what their assignments are, but remind them that you are proud of them are there to support them. As much as is appropriate, allow the child to have a say in when their homework will be done – right after school, after supper, etc. You may not agree with their preference, but just discussing it with them will give your child a sense of empowerment. Most of all – praise, praise, praise. They thrive on it! These are all super cute ideas for different reasons. Glad you liked the ideas, Cindy. Hope you’re doing well! My kids are all grown now, but what great ideas. I especially like the loft bed. I’m sure my kids would have loved to have something like that. Oh wow, Sandy – my daughter would have LOVED the loft bed! I’ve been trying to talk her into doing one in my granddaughter’s room. Glad you liked the ideas! My office is in the family room so I’m always looking for ideas on how to improve how it looks.